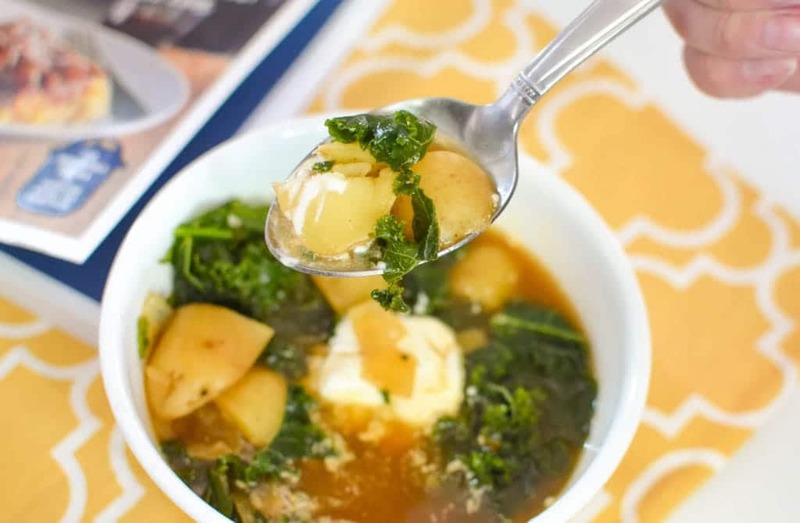 This Instant Pot Smoky Potato and Kale Soup recipe has the smokiness of chili in a warm, comforting vegetarian soup made with baby potatoes and fresh kale. Thank you to our sponsor Workman Publishing for introducing us to an exciting new Instant Pot cookbook! I bought an Instant Pot last year on a whim, and I have to say, it has been a life-changing appliance in my kitchen. Whenever I’m short on time, I can grab a few ingredients (even ones from the freezer!) and throw them in the Instant Pot and dinner will be ready before I know it. Since I’ve had my Instant Pot, I’ve tried a variety of recipes, including hard boiled eggs, ribs and chili— all have been amazing. When I find a good recipe, I tend to stick with it! 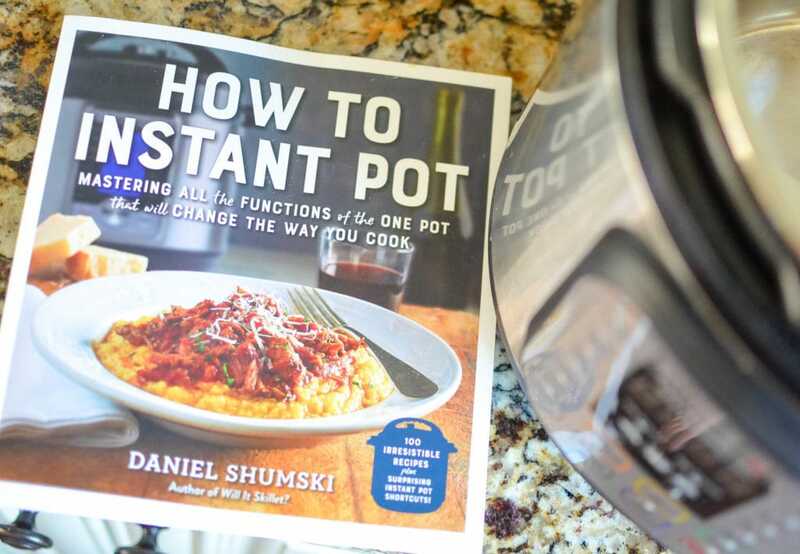 Because of this, it’s been awhile since I tried something new, which is why I was super excited to get my hands on a copy of How to Instant Pot by Daniel Shumski. How to Instant Pot includes over 100 delicious one-pot recipes, organized by function. This is the only Instant Pot cookbook that breaks down each function with corresponding recipes! After going through the book I realized I was only using a fraction of my Instant Pot’s features. Did you know you can make yogurt and desserts in your Instant Pot? Or use it as a slow cooker? Needless to say, How to Instant Pot was eye-opening and showed me how much more I could be using the revolutionary appliance that’s changing the way we cook. 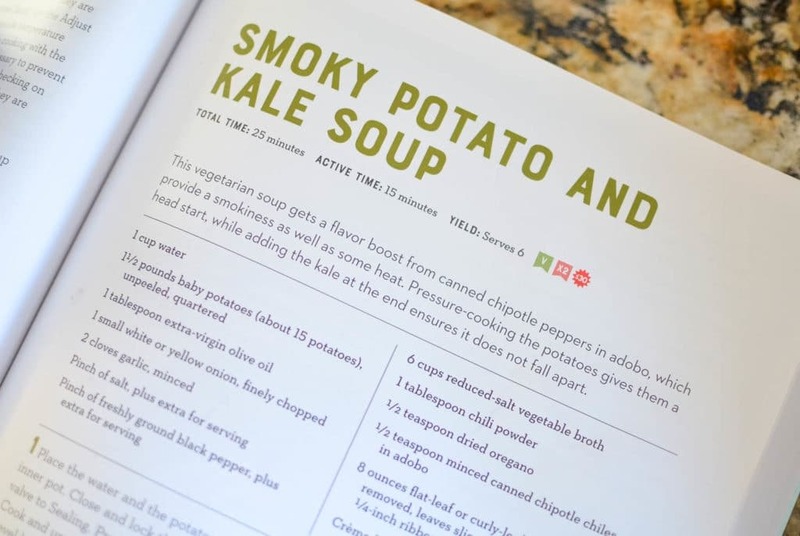 If you have an Instant Pot or are thinking about getting one, this cookbook is a MUST-HAVE! For my first recipe from How to Instant Pot, I wanted to try a soup, because it’s the season for warm, comfort food! 1. Place the water and the potatoes in the inner pot. Close and lock the lid. Set the valve to Sealing. Press Manual or Pressure Cook and use the Pressure or Pressure Level button to select High Pressure. Use the – or + button to set the time to 1 minute. 3. Remove the lid. Wearing oven mitts, remove the inner pot (be careful—it’s hot! 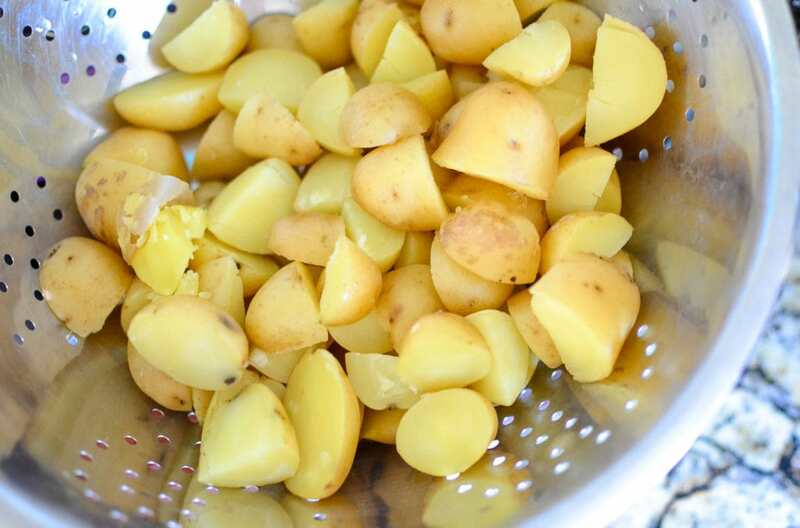 ), drain the potatoes through a colander, and set them aside until step 6. Return the inner pot to the appliance. 4. Press Cancel, then press Sauté and use the Sauté or Adjust button to select the lowest temperature (“Less”). Place the olive oil in the inner pot, wait about 1 minute for the oil to warm, then add the onion, garlic, and a pinch each of salt and pepper. Cook with the lid off, stirring occasionally, until the onion softens slightly, about 5 minutes. 5. Add the broth, chili powder, oregano, and chipotle and stir to combine. Press Cancel, then press Sauté and use the Sauté or Adjust button to select the middle temperature (“Normal”). 6. Allow the soup to come to a simmer, about 5 minutes. 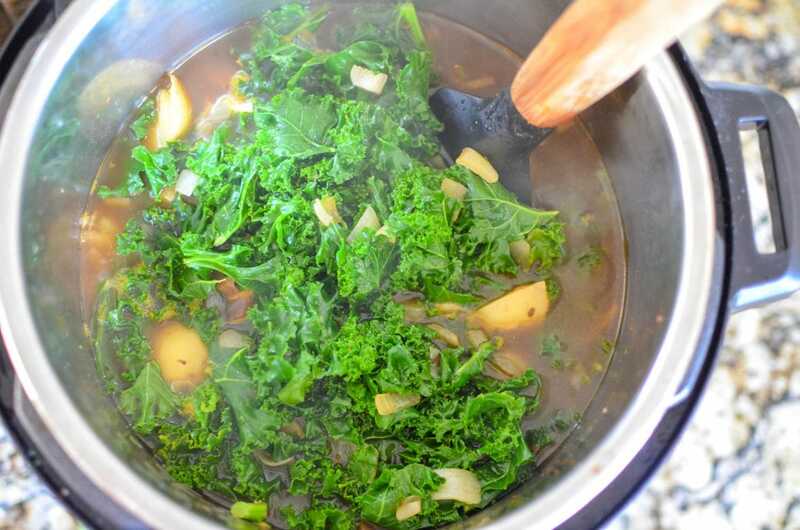 Add the kale and reserved potatoes, stir to submerge the kale, and cook until a steak knife easily pierces a potato and the kale is soft, about 5 minutes. 7. Serve hot, garnished with a dollop of crème fraîche and a dash of salt and pepper. 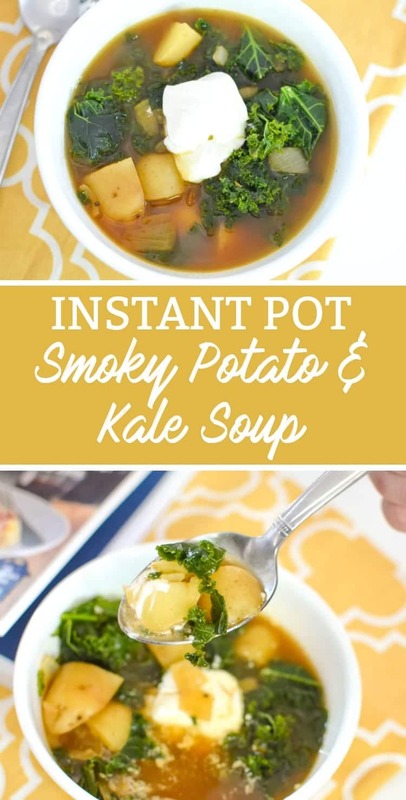 Instant Pot Smoky Potato and Kale soup will keep, in an airtight container in the refrigerator, for up to 5 days. To reheat, place the soup in a pot and warm on the stovetop over medium heat, stirring occasionally, for about 5 minutes. My husband and I couldn’t wait to try the soup because it smelled so delicious, having many of the flavors of chili. 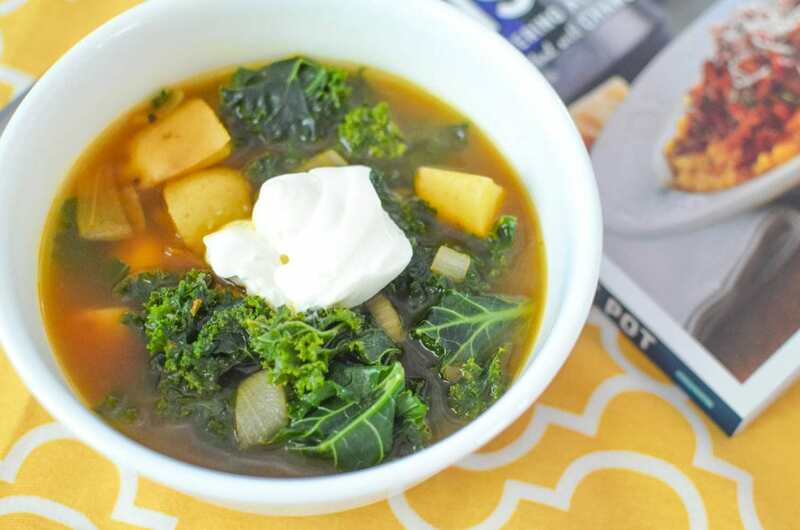 The Smoky Potato and Kale Soup from How to Instant Pot did not disappoint and the added sour cream really is the icing on the cake for this recipe. We even went back and added some extra chipotle chiles in adobo for an even more smoky flavor….We will be making this recipe again and again (and trying many more from How to Instant Pot)! How to Instant Pot is both a guide to understanding the Instant Pot basics and a foodie’s creative collection of over 100 recipes specially crafted to take advantage of the Instant Pot’s many virtues, from cooking perfect risotto in six minutes, no stirring required, to five kinds of yogurt, to creating one-hour killer chili and soups from scratch, using dried beans. I think it makes brown rice extra fluffy! It works better than my rice cooker ever did! I don’t own an instant pot yet but i would love to make a chili in one! I just got mine and haven’t used it yet so I don’t have a favorite recipe, but this soup looks like something I would enjoy. I really dont have a favorite recipe because I do not own an insstant pot. I just got my instant pot and have yet to use it so I don’t have a favorite recipe. I love making hard-boiled eggs in the instant pot. They always turn out so well. It’s also great for soups and stews. I don’t have a favorite yet but I’m looking for ideas to try! I don’t have an instant pot, but we do like pulled pork. I like to make a whole chicken in my instant pot . I do not own one, yet. I would make barley soup..
My favorite so far is chicken noodle soup. The only thing that I have been brave enough to make in it yet was meatballs in sauce. i like to make chicken and rice in my instant pot. they are the best. I just got mine and so far have made some beef stew. I don’t have an instant pot yet, but I would make ribs. So far I like rice and beans! I do not have an instant pot, at least not until I win, so I do not have a favorite recipe yet! Pot roast is a favorite. My wife would absolutely love and ,Instant Pot Beef Stew everyday. My wife would absolutely love s cool Instant Pot Beef Stew everyday. A fascinating and amazing Instant Pot Chicken Parmigiana, my wife would definitely want to have for a great meal. My lady friend would like an Instant Pot Pork Carnitas meal as just marvelous for all occasions. Captivating and fabulous Instant Pot Teriyaki Turkey Meatballs, my girlfriend likes to eat and enjoy all of the time. Awesome Instant Pot Chicken and Dumplings are just right, for the day and my wife.